Money in Politics, Pt. II | Is Money Speech? In Part I of this mini article series, I reviewed the historical and ideological basis of corporations are people. This is one of the two major premises that the case of Citizens United v. FEC was ruled upon. If you have not read Part I, I strongly suggest doing so as it will give you a background of the Citizens United case. In this article, I will cover the second premise that Citizens United rests upon: money is speech. 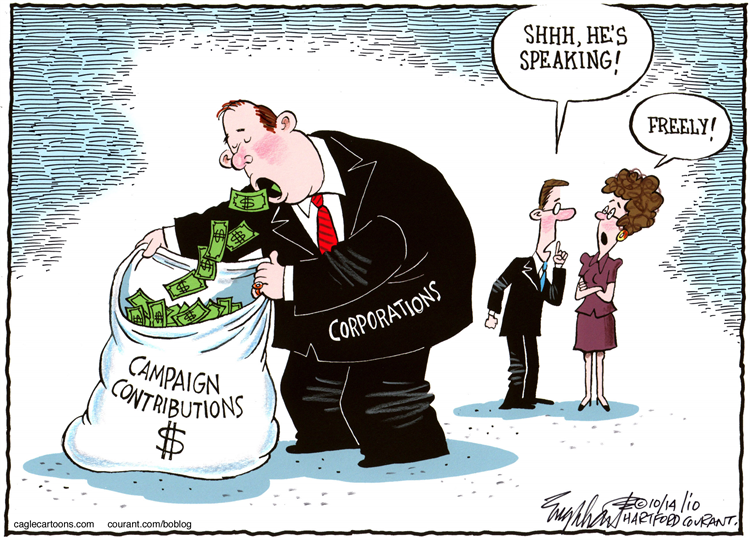 The second premise that the Citizens United and precedent cases rest upon is the notion that money is speech. In the 1975 case of Buckley v. Valeo, the court declared that each dollar spent lead to an increase in the “quantity of speech,” If limits were then placed on campaign spending, it would be synonymous with limiting any form of political speech. In the way that the Court ruled, this naturally violates the First Amendment. This seems rather flawed considering the fact that money itself is not the speech. Rather, the money is used to amplify and give exposure to speech. The Court also outrageously declared that politicians are somehow less indebted to or corrupted by people independently spending large amounts of money in an effort to get them elected as they are to those who contribute money directly to their campaign. They also believed that there is no interest in part of government to facilitate equal participation in the campaign process. The high cost seen with the 2018. Mid-term elections undermines democratic ideals. Why? It leads to those with extraordinary wealth and direct interest to funding candidates who align with their interest. Spending money in and on election-related expenses indeed allows people express themselves and can lead to political speech. Take for example advertising. There are several components to address: the content piece, such as an image or video; copywriting, which is the text in the case of social media or other written advertising; the medium or channel, such as social media or television; and the cost to reach the desired audience. In this context, the speech would obviously be the piece of content and or the copywriting. While the money spent to reach the desired audience facilitates the speech, it alone is not the speech itself. Declaring that money is speech therefore allows the largest corporations and uber-wealthy to have an unequal amount of speech. This leaves the overwhelming majority of the American population and small businesses unable to participate in elections in any meaningful way. In theory, this would lead to an incredible amount of political power being held by the largest corporations and wealthiest individuals. These corporations and individuals makeup a small share of the American population. By definition, this type of influence is an oligarchy or plutocracy. It most certainly not a democracy. Various studies have shown that only 0.24 percent of the American population makes financial contributions above $200 to candidates at the federal level. In 2010, this fraction of the 1 percent financed $1.3 billion, which amount 90 percent of all money raised by federal candidates. In that same year, 64 percent of the financing came from people who shelled out $2,300 or more to candidates and committees that aligned with their interests. That is one in every 2,000 Americans or 0.004 percent of the population. Super-PACs were born in the wake of Citizens United and subsequent rulings. These organizations are legally allowed to receive unlimited financing from corporations and individuals. Super-PACs are then supposed to fund “independent election advertising.” This becomes problematic when we view the data. In the midterm elections of President Obama’s second term (2014), $113 million (16 percent of all money raised by super PACs) went to committees that were dominated by one donor. Reading between the lines, we can see that many of these so called “committees” function as legal shell organizations for large money interests. As I previously outlined in my article centering around the extreme inequalities found in the American economy, our nation faces extreme income and wealth inequality. To be clear, I am not advocating for redistribution of wealth. Rather, I am simply illuminating the fact that extreme wealth inequality exists in America. The fact that money has become to be considered speech has devastating consequences for the overwhelming majority of Americans. How can an individual who cannot afford a basic need such as a rent or food worry about contributing money to a political campaign? Forty percent of Americans, which equates to 100.8 million people of voting age in America, struggle to afford a basic need such as rent or food. An electorate system that allows for unlimited political spending does not resemble that of a democracy. Once again, this by definition resembles an oligarchy or plutocracy. We have long been sold on the false notion that we are electing our candidates directly. While we do have the right to vote, this is not the full story. Candidates from both the Democratic and Republican parties are financed to be the candidates through these special interests. Candidates who align more with the needs of the public, which oftentimes fly in the face of ultra-wealthy and large corporations, will typically receive inadequate financing. Financing is not only vital to win an election, financing is crucial to secure a nomination. In many ways, one could argue that this has facilitated the “lesser of two evils” mantra that we have come to accept. In a paradigm where money equals speech, Big Money is extremely important win elections. The absurd claims in the rulings of Buckley v. Valeo and Citizens United v. FEC insinuates that more money leads to increases in democratic participation. Massive spending on elections distorts the elections. Rather than the voices of ordinary people being heard, the American voting population is often presented with two candidates who will not act in their interest. Of course, the job of these candidates and special interests are to convince the voting population otherwise. It takes money to make money. You have likely heard that phrase before. With rampant political spending, it takes money to secure the nomination and then even more to win. Big Money decides elections. That is not my opinion. It is a fact. In 2010, power changed hands in seventy-five elections. Of these, sixty of the winning candidates were fueled by big money from outside groups. After the decision of Citizens United, outside spending has dramatically increased. In the 2006 mid-term elections, outside spending accounted for $60 million. In the 2018 mid-terms, this figure accounted for $1.31 billion, an increase of 2,083% in just twelve years. Take for example Sheldon Adelson, the world’s wealthiest casino owner, and his wife Miriam Adelson. In the 2012 election cycle, they gave $36.3 million to super PACs and other outside groups. This would take 321,000 average American families donating an equivalent share of their wealth to match what the Adelsons gave. Do you think the interests and concerns of people like Sheldon Adelson align with majority of Americans? Abraham Lincoln stated that government should be “of the people, by the people, and for the people.” The majority of Americans want a change. 90 percent of Americans want Big Money out of politics. 69 percent think that large businesses have too much power and influence in Washington. 59 percent (72 percent of likely voters) believe that Wall Street has too much power and influence in Washington. 65 percent of Americans think our economic system “unfairly favors power interests.” This same research found that 60 percent of Republicans with incomes of at least $100,000 state that our system is indeed fair. In a time when the average cost of being an elected official continues to increase at every level of government, groups like Super PACs enable the wealthiest Americans and largest corporations to buy influence in government. The interests of the super wealthy and largest corporations do not align with small business or the average American. The White House, US Senate, US House, Governorship, state legislatures and judicial branches are essentially up for sale. Big Money in American politics has somehow become framed as a partisan issue. Yet, a quite substantial amount of donors play both sides of the aisle. Why? No matter who wins, their interests will be served. When these ultra wealthy individuals and large corporations win, the American population loses. Campaign finance reform is not a progressive or conservative issue. It is issue of whether our government structure will continue to become more aligned with an oligarchy/plutocracy or return to the image in which America was created to be: a democracy.